Berkshire Hathaway bought back nearly $1 billion of its own shares. Warren Buffett, perhaps the world’s most famous investor, recently had a novel idea for where to put his company’s cash: for the first time since 2012, Berkshire Hathaway bought stock in… Berkshire Hathaway. Berkshire relaxed its buyback policy in July, allowing chairman and CEO Buffett and vice president Charlie Munger to repurchase the company’s own stock whenever it, in their minds, fell below its “intrinsic value.” Previously, buybacks were more restricted, based on the firm’s book value per share. Buffett’s company reported today (Nov. 3) that it repurchased $928 million of its shares in August. Its previous buyback was $1.3 billion in December 2012. 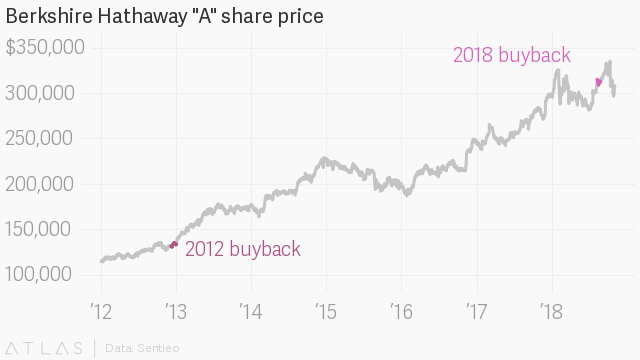 Berkshire Hathaway’s stock has gained about 130% since its 2012 buyback, versus a 90% gain in the S&P 500 over the same period. Its shares have slipped a little since the most recent buyback, however. Berkshire has around $100 billion in cash available to invest, so the purchase won’t put much of a dent in its balance. Still, it sends a signal that Buffett can’t find anything else worth buying at the moment, or thinks that the market is undervaluing his own company’s shares (a common feeling among CEOs, naturally). Apart from upping its stake in Apple to around $46.6 billion earlier this year, Berkshire hasn’t made a major investment since it bought Precision Castparts for $32 billion in 2016. The buyback announcement came as Berkshire delivered a dazzling third-quarter earnings report, with operating profit doubling in the third quarter, to $6.9 billion, from a year earlier, boosted by lower taxes and few natural disasters to drag down its insurance businesses. When added to the paper profits implied by gain in value of the company’s large investment portfolio, which had a very good third quarter, Berkshire racked up a whopping $18.5 billion profit in its latest quarter.